Nassim Nicholas Taleb, most famous for authoring "The Black Swan: the impact of highly improbable fragility", also has a just-as-interesting book: "Antifragile: things that gain from disorder"
Taleb's objective for this book is to be the definitive explanation of the spectrum of fragile (read: Black Swan, incalculable risk), robust (read: survivable, calculable risk), and antifragile (read: risk driven improvement). Antifragile systems not only can absorb shock, but the disorder/disruption is actually fuel for innovation and improvement. They next shock will have less effect; any new system will build upon the disorder of the past and be better. And, we're not talking physical systems necessarily; all manner of human factors and biological systems are included, along with political systems, etc. In business, he says the restaurant and aviation sectors are antifragile, constantly learning from mistakes, and the financial industry is fragile -- vulnerable to black swan events. Taleb makes the point that the qualities of antifragile are at the same time domain dependent -- that is, context sensitive -- and domain independent -- that is, it is valid to represent the phenomenon in one domain with similar characteristics in another domain, though often we miss this cross domain connection. "We are all, in a way, ... handicapped, unable to recognize the same idea when it is presented in a different context. It is as if we are doomed to be deceived by the most superficial part of things, the packaging...."
"Layers of redundancy are the central risk management property of natural systems. ... Redundancy ...seems like a waste if nothing unusual happens. Except that something unusual happens— usually." Almost every project I know of embraces continuous improvement. But to make it effective, CI should be paired with reflection, investigation of root cause, and actionable strategies. These get at the learning component of being antifragile. Actionable strategies begin with a dolop of system engineering: decouple where possible to trap problems before they propagate. Decoupling is most often accomplished by modularity and defined interfaces. And then we add redundancy -- equivalent capabilities implemented in different ways decoupled for independence -- and cohesion. Cohesion is the property of absorbing shock without failure. We get at this with buffers, redundancy, and elastic physical properties. 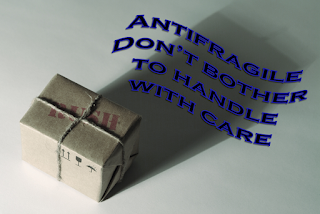 [We] .. detect antifragility (and fragility) using a simple test of asymmetry: anything that has more upside than downside from random events (or certain shocks) is antifragile; the reverse is fragile.